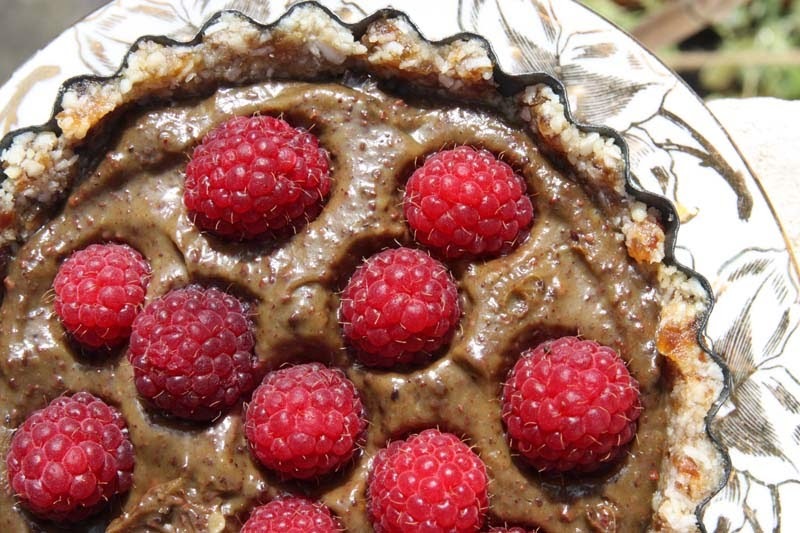 I know, I know another vegan, gluten free Raw Food Tart filled with raspberries. The truth is that I am trying to make the most of my garden raspberries while they are still coming from my garden. Also I want to tease some of you as this Sweet Pie is not all that it seems. The mousse that is mimicking the appearance of dark chocolate is actually not chocolate. For a start, it is not even chocolate, it is cacao nibs. 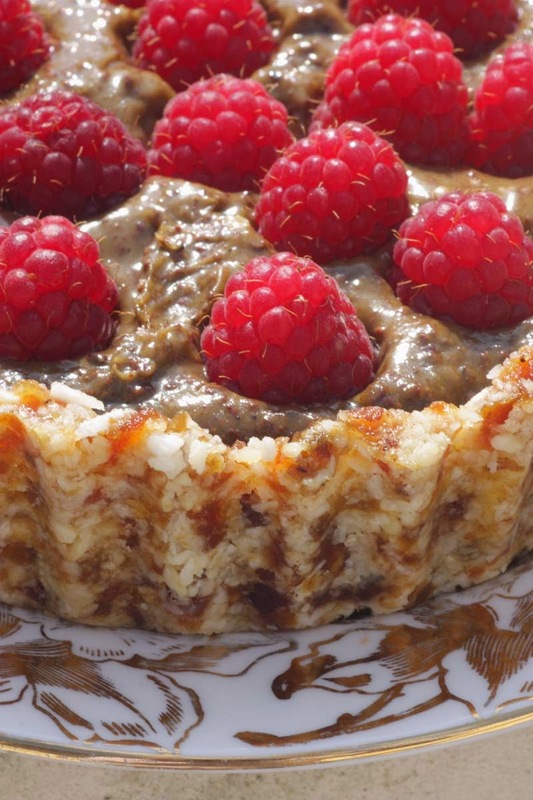 Secondly, what gives this pie filling a mousse like texture? There is a mystery ingredient well hidden in it - Avocado - a raw vegan nifty culinary trick I picked up from raw food bloggers when I first started blogging in 2009. Its absolutely amazing how avocado can form the base for one of the most luscious raw puddings around. In fact Avocado Chocolate Pudding is probably one of the most popular raw food desserts around; and experienced raw fooders have probably had more raw chocolate pudding than they care to remember and don't quite understand what the fuss is, but for some us especially those living in the U.K, outside of the raw food scene its a very new way of preparing food and is getting big Wows! Anyway, this is my second recipe in the week with cacao nibs. The first was Cacao Nibs, Raw Chocolate and Cocoa Muesli. A little while back, I made some raw chocolate from scratch and have since acquired a taste for raw cacao. Cacao nibs can be ground and added to cakes and puddings. I have to admit it is not to everyones taste, but give it a try, you just never know. I dub these Cacao Nibs and Avocado Pie - Sludge Pie, because it sounds a little more intriguing, and the ingredients certainly are. The avocado is not overly strong, in fact when I presented a tart to my husband to try out, I did not tell him of the avocado content. He enjoyed it, said it was unusual, different but nice. He was unable to put his finger on the unusual ingredient, then I decided to drop a big hing, he goes 'oh now you say it - I can sort of taste it now, but its not overly detectable', which I guess is a thumbs up. I was pleasantly surprised too. For those of you who don;t like cacao nibs or find it is an acquired taste, feel free to substitute with cocoa powder. Also if you eat this pie on the day, the cacao nibs have 'chocolate chip' texture, if you eat them a day later, they soften. So its up to you how you would like to enjoy it. 150g cashew nuts, raw (soaked for 2 hours if you do not have a high power like Optimuum 9400 blender). This blitzing process should also work in a good food processor too. Put all the ingredients into the and blitz until roughly chopped, it needs to be soft pliable consistency, not soft like nut butter. Tip out into the pastry case and press down with your fingers, even up the side until well covered. Put all the ingredients into a food processor and puree until smooth, pour carefully into dried fruit and nut cases. Top with optional raspberries and chill until ready to serve. If you leave overnight, the cacao nibs will soften. 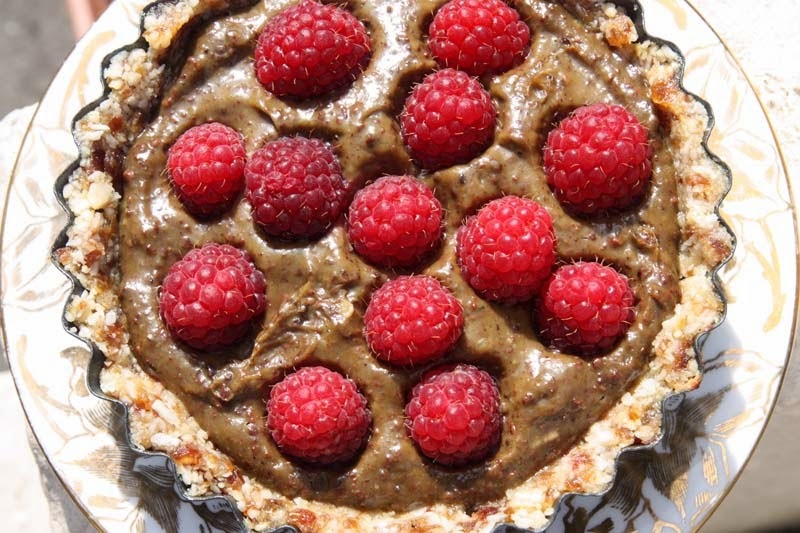 NOTE: Because of the raw vegetable and fruit filling, this tart is best refrigerated and eaten within a couple of days. Thank you Johanna, then you can vouch for it being a good combo. So glad to note that you have made it too, not new eh! The blender is great, but I do appreciate that not everyone had one. I am trying to make the most of my raspberries, after summer is gone, the autumn ones will arrive. Thank you. Totally okay, I will come on over in a while.